I just wanted to thank you very much for the master class you had here in France. It was so refreshing to hear your musical thoughts; you opened a window in our room, and this new air is still helping us to breathe! 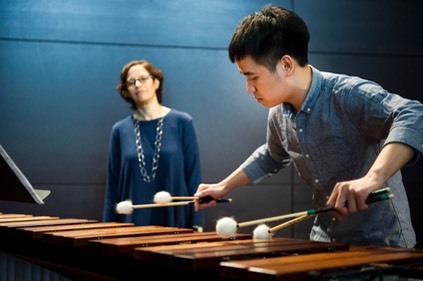 Zeltsman has presented marimba master classes at numerous institutions including The Juilliard School, Conservatorium van Amsterdam, Royal College of Music (London), Conservatoire National Superieur Musique de Lyon, Brussels Royal Conservatory, Curtis Institute of Music, Temple University, Eastman School of Music, and San Francisco Conservatory. Nancy was a guest marimba professor at Hochshule fur Musik in Detmold, Germany for the spring 2010 semester. She has presented classes at Tromp Repertoire Days in Amsterdam and dozens of statewide Percussive Arts Society chapter events, and has performed/presented at ten PASICs since 1988. Nancy has taught at percussion events abroad in Dudelange, Luxembourg; Shenzhen, China; Akita, Fukui, Kyoto and Osaka (Japan); Mexico City and Chiapas (Mexico); Merza and Alcoy (Spain); London and Manchester (England); Stockholm (Sweden), Geneva (Switzerland), Linz and Vienna (Austria), and Zagreb and Samobor (Croatia). Your musical concepts, approach to performing the instrument, and personal sensitivity in both your playing and teaching are incomparable.